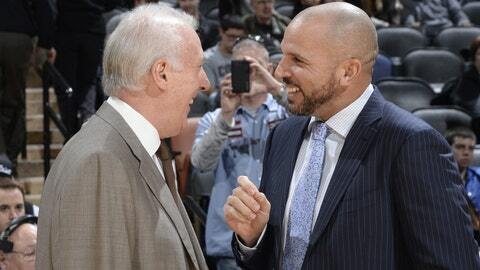 Gregg Popovich and Jason Kidd were all smiles before the game. Few Nets were smiling afterward. The Brooklyn Nets just can’t buy a win. Or a team. Or a break. So what were we expecting to happen to the Nets when they faced off against the defending Western Conference champion San Antonio Spurs on the last day of 2013? A loss. We were definitely expecting a loss. You could almost forgive the Nets for giving up and walking away from the game early, right? They were down by 21 points, with less than one second left to play in what was about to become their 21st loss of season. It’s ugly, and it’s hard to sit through. Trust us. But these guys are supposed to be professionals. And when your coach – even if you’re unfortunate enough for it to be Jason Kidd – has to chase you down in the locker room and back onto the court to finish taking your lumps, you know you’re plumbing new depths. For his part, Kidd told the New York Post that his team legitimately "thought the game was over" – not just virtually, but, like, officially. Yes, Coach. Unfortunately for us all. That’s how it’s been all year for the Nets. Let’s recap some of the team’s misery, shall we? • But first, KG and Kidd reportedly took it out on the team. • Brooklyn’s coaching staff isn’t faring much better.